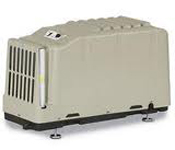 A basement dehumidifier will solve your wet basement problem. I provide reviews of the best models for basements and explain why a portable unit may not be the most effective solution for high basement humidity. Basements are unique places within our homes. They can be quite large and are partly or completely below ground level. Being at the bottom of the house basements are the coldest places in the home. Warm air rises and, being below ground level, the basement does not warm as the outside air temperature rises. Relative humidity is higher when the air is cold so what is safe and comfortable in the rest of the house may be less so in the basement. It is for this reason that portable dehumidifiers are used more often as basement dehumidifiers than for any other purpose. Many basements, particularly in newer homes, have an effective barrier against water but many have poorer protection and some none at all. Without such protection ground water will penetrate basement floors and walls and cause humidity problems and even serious damp. Ventilation can also be more difficult in the basement than elsewhere which further increases the risk. A wet basement can cause problems throughout the whole house, particularly for allergy sufferers as mold and dust mites flourish in damp, humid conditions. Basements are used for a variety of purposes. In some homes they are an extension of the living space, in others they may contain working areas, a laundry room or workshop for example. Personal comfort becomes an issue here and, especially in more humid climates, you may want to use a basement dehumidifier for this reason. Others use their basements for storage and may only go there occasionally. In these cases it is the protection of the stored items which is the first priority. Of course, many basements are used for a combination of these purposes. The way your basement is used can be important when it comes to your choice of humidity control. If it is used daily as part of the living or working space it is likely that you keep it comfortably warm. If your basement is soundly protected from ground water and you keep it warm it is not necessary to use a basement dehumidifier. A simple portable unit, of a sufficient capacity for the area of your basement, is adequate, and cheaper. I always recommend that a basement dehumidifier should come with a humidistat, so that it switches off when the humidity falls to your pre-set level, because this saves on energy bills but other refinements are a matter of personal choice. A continuous drainage feature is a convenience but if you are in and out of the basement every day you may not consider it too much of a chore to empty the bucket a couple of times a day by hand. If your basement is not letting water in from outside and is mainly used for storage it will be cooler. The relative humidity will be higher than in the other parts of the house and the likelihood of the temperature falling below the "dew point", the point at which water vapor condenses, will be greater. This has two main implications. First, your need for a basement dehumidifier will be greater, second, the model you need must be able to work at lower temperatures. Once again a portable unit may be suitable but it will probably need two further refinements. First, a continuous drainage facility which will seem much more important if the only reason you need to go to the basement twice a day is to empty the bucket! You must decide that one. Second, it must have an effective defrosting feature to enable it to work at lower temperatures. Of course this is your decision too but not having this means that the appliance, if it freezes, will continue running but not extract any water. It also is likely that the unit will be damaged and its working life shortened. A basement dehumidifier is designed to work under colder conditions so it may be the better choice. In the case of a basement protected against ground water and used for storage the larger the basement the stronger the argument for using a purpose designed basement dehumidifier. If your barrier against ground water is not fully effective, or non existent, and your basement lets in water, a basement dehumidifier is what I would recommend. In a very small basement you might get by with a suitable portable but for the typical basement this is likely to be inadequate. A specialized basement dehumidifier is more expensive but has to do a lot of work. If your basement lets water in you need a high capacity machine to extract sufficient amounts to keep it dry. If it lets more water in at some times than others it also needs spare capacity so that it can remove that water in the shortest possible time. Please be sure to select an appliance powerful enough for the area of your basement. If you choose this kind of machine you can be certain that it will operate at low temperatures. Continuous drainage is now essential. Due to the volume of water being extracted it is not practical to empty the bucket by hand and, of course, you will not want the unit to stop working because the bucket is full. 1 What capacity do I need? All dehumidifiers have a specification and this should state the area of the space that it can comfortably keep dry. Due to the rather unrealistic conditions under which this data is collected I recommend that you buy a unit "one size bigger" than the specification suggests, particularly if your space is close to the maximum area specified for a particular model. This is particularly the case with a basement dehumidifier where the amount of water can be very high, especially if there is a sudden increase in water penetration, for example following heavy rain. The main issue here is the continuous drainage function. If you have a water outlet, drain or sump, to which you can run a hose it should be a simple matter. If you do not, or wish for a neater solution you may need a professional to assist with installation. In a larger basement, even if the area is not partitioned into separate rooms, ducting the incoming and outgoing air flows will increase the machine's effectiveness and ensure a more even distribution of humidity. An alternative is to have one or two fans in the basement to assist the circulation of air. Bear in mind that the preferred location, if ducting is not used, is somewhere in the centre of the basement. 3 What maintenance is required? In normal circumstances the refrigeration coil should be cleaned once a year and the filter twice a month. These are relatively simple tasks for the typical householder. 4 When should I have it switched on? In areas with cold winters it is not usually necessary to have the unit running at the coldest times of the year. For those living in warmer climates it is probably wiser to run it all year round. I can recommend any of the units described in the following sections but for the "cream of the crop" take a look at the models I rate as outstanding. The SaniDry XP is made in the USA by Therma-Stor and virtually identical to that company's Santa Fe Classic. The SaniDry brand is applied to this unit which is then sold and installed by basement renovation specialists licensed by Basement Systems Inc.
Because the XP is essentially the same machine as the Santa Fe Classic it shares all the Classic's advantages of rugged durability, effective low temperature operation and energy efficiency and I have no trouble in recommending it for its technical merits. The XP cannot be bought "off the shelf" in the same way as the Santa Fe Classic and, for that reason alone, you may wish to consider which of the two is the best choice for your basement. This is explained in more detail in my review of the SaniDry XP which you can read by clicking on the link just below this paragraph. The Santa Fe Classic Basement Dehumidifier is aptly named and is, in my opinion, the best model made in the USA or sold in the USA specifically for use in a basement. The Santa Fe Classic is a tough and dependable unit which is able to operate in lower ambient temperatures at which portable units lose effectiveness and run continuously, wasting energy. The Classic is costly to buy but much less expensive to run than a portable unit and will last much longer. The Classic is built by Therma-Stor, a US company which markets dehumidifiers under the Hi-E-Dry (commercial), Phoenix (water damage restoration), Ultra Aire (whole home) and Santa Fe (basement and crawl space) brands as well as similar models for Basement Systems and Honeywell. All Therma-Stor models are made in the USA. 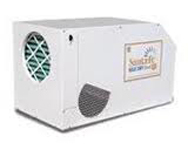 The Santa Fe RX Basement Dehumidifier has a slightly lower capacity that the Santa Fe Classic but shares the Classic's excellent build quality and low temperature operating capability. The Santa Fe RX is enclosed in a rather more "eye friendly" casing and is intended for use in finished basements where the appliance may be more frequently in view. The unit is also internally lined with sound deadening material which reduces the noise output to just 54dB. The biggest disadvantage of the Santa Fe RX is its purchase price which is higher than that of the more powerful Classic. Whether this price is worth paying will depend in the value you place on a more pleasing appearance and quieter operation. The Aprilaire 1710 is one of the few high quality alternatives to models made by Therma-Stor (Santa Fe, Ultra-Aire, SaniDry and Honeywell models). Like Therma-Stor products Aprilaire models are made in the USA and Aprilaire is committed to sourcing as many of their parts as possible from US manufacturers. The Aprilaire 1710 is not Energy Star qualified. When originally introduced the 1710 met the current Energy Star standard but since then Energy Star has "raised the bar" and this model no longer achieves the required Energy Factor. Despite this the Aprilaire 1710 is an effective and durable unit that is far more energy efficient than any large portable model and much more effective in low temperatures. For these reasons, and because of the consistently high rankings given to this model in reviews by users, I am happy to recommend this unit and consider it one of the best models you can buy for your basement. The SaniDry CSB is another model manufactured by Therma-Stor and labelled with the SaniDry brand. It is identical to the Santa Fe Advance and therefore a technically sound unit in which I have complete confidence. As in the case of the SaniDry XP Basement Dehumidifier the issue for you is whether to buy a Santa Fe Advance from any one of a number of retailers at the stated ticket price or whether to purchase it from Basement Systems at a price that will include the cost of installation. The Santa Fe Advance is manufactured by Therma-Stor and is low in height to fit more easily into a typical crawl space. Mechanically it is similar to other Santa Fe models and is, therefore, equally suitable for use as a basement dehumidifier. You may prefer this model to the Santa Fe Classic, for example, if your basement is less than 2200 square feet or if the long, low design makes the Advance easier to site in a convenient spot where space is a little tight. In common with all Santa Fe units the advance will perform effectively in cooler ambient temperatures and is very energy efficient with an energy factor of 2.65 (litres of water removed per kilowatt hour of energy used). The Santa Fe Advance receives glowing reviews from users and is a popular and reliable unit. I have no hesitation in recommending this unit to all our visitors. The Santa Fe Compact is the lowest capacity unit in the Santa Fe (Therma-Stor) range. Despite its "lower capacity" the 70 pints per day Compact will effectively control humidity in basements and crawl spaces of up to 1600 square feet. This unit is, as its name suggests, remarkably small and weighs just 55lbs, little more than a large portable. It also provides a range of installation options and may, for example, be suspended above the floor, if this is more convenient, using the optional "hang-kit" available from Therma-Stor. 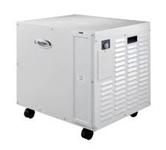 For a cold basement or crawl space, even as cold as 40°F, this unit will provide superior performance to a portable unit and use much less energy. The Santa Fe Compact is an outstanding appliance and one which I can whole-heartedly recommend for small and medium sized basements and crawl spaces. The Santa Fe Max Dry Dual XT is unique among purpose-designed crawl space models in its capacity to control humidity throughout an area of up to 3600 square feet. It is remarkably energy efficient and can extract over 150 pints of water per day while using the same amount of energy as a single portable removing just 70 pints. For those of you with exceptionally large basements or crawl spaces this is a model that deserves your serious attention. As well as effective low temperature operation this unit offers the option of ducted installation, a huge advantage in a huge basement. The Santa Fe Max Dry is an excellent all round performer, has no credible competition and is my number one recommendation for large crawl spaces and basements. The Santa Fe Impact XT is a brand new crawl space unit from Therma-Stor. In terms of power the Impact slots in between the Santa Fe Advance and the Santa Fe Max Dry and will control humidity in a large basement or crawl space of between 2000 and 2500 square feet. Inevitably this unit is quite heavy, at 140lbs, so easing it into position is not a one person job but once in place it should not need to be moved again and requires minimal maintenance. The most appealing feature of the Santa Fe Impact is its energy efficiency which puts it in a class of its own among basement and crawl space dehumidifiers. Given its pedigree and low running costs the Santa Fe Impact is a model I am more than happy to recommend for your basement or crawl space. The Aprilaire 1750a is designed as a whole home unit integrated with the existing HVAC ducting in an apartment or smaller house. The 1750a can be used as a stand-alone unit, has low temperature operating capability and the capacity to operate effectively in areas of up to 2200 square feet. This unit is suitable therefore for use in your basement or crawl space and could be considered as an alternative to the Santa Fe Classic or the Santa Fe Advance. Taking everything into consideration my view is that the purpose-designed Santa Fe units are superior basement dehumidifiers although the Aprilaire 1750a is excellent for the whole house. The one factor which may swing some of your toward the 1750a is its quieter operation; 54 dB vs. 62 dB for the Santa Fe Classic and 64dB for the Santa Fe Advance. 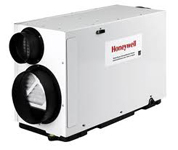 The Honeywell Whole House Dehumidifier range is manufactured by Therma-Stor and the models in the range are equivalent to those included in Therma-Stor's Ultra-Aire line up. 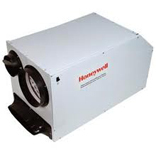 All three models are capable of operating with or without ducting, are effective in lower temperatures and can be considered for use in crawl spaces or as basement dehumidifiers. From the user's point of view there is little advantage in choosing a Honeywell (or Therma-Stor) whole home model in preference to a dedicated basement or crawl space unit but, if the whole home equivalent is more readily available or cheaper where you live, you may be confident that they will work just as well. 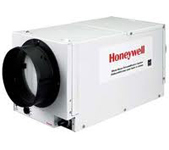 The smallest unit in the Honeywell range is the DR65. This unit would be suitable for a basement or crawl space of up to 1600 square feet. The Honeywell DR90 is equivalent in power to the Santa Fe Advance. With its 90 pints per day water extraction rate this unit will deal with larger basements and crawl spaces, up to 2200 square feet. The Honeywell DH150 is by far the most powerful of the three Honeywell units. It matches up to the Santa Fe Max Dry XT and will be effective in a basement or crawl space of similar area, up to 3,600 square feet. 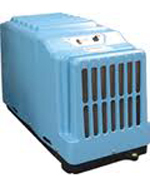 The Ebac RM65 is a water damage restoration dehumidifier. Restoration models have to be tough so you can count on this unit to be long lasting. This unit is included because it can operate in very cold basements, down to 41°F (5°C), which is cooler than any model sold as a basement dehumidifier is designed for. Ebac is a British company which manufactures all Ebac models in the UK and has a solid reputation in the US commercial dehumidifier market. As restoration units go this unit is very competitively priced and costs about the same as the Santa Fe Advance. For anyone with a really cold basement this is a model I would encourage you to consider. The ultimate in affordable models for the coldest of cold basements is the Dri-Eaz DrizAir 1200. This unit is more expensive than the RM65 but still in the same "ball park" and will remain effective in temperatures just a degree or so above freezing point. Like the RM65 this is a water damage restoration unit and should give reliable service over a period of years. The DrizAir 1200 is made by Dri-Eaz, in the USA, which may make it more attractive for many of our US visitors. If your basement ever gets as cold as 33°F (1°C) this is a model which should definitely be on your short-list when you are making your final choice of basement dehumidifier.